Two stunning locations on Maui, see the breath taking vistas and get up close and personal with the local wildlife. Kaupo Ranch is one of the oldest private cattle ranches that has been in operation for over 100 years. Stepping on to Kaupo Ranch is like being taken back in time. It truly is the wild west of Maui. The area is rich in ancient history as told by Hawaiian mythology and archaeological evidence. It is believed that the first Polynesians to arrive in Maui landed in this part of the island. In ancient times, the Kaupo area was said to be the most populated area of Maui, as described by Captain La Perouse. This French captain was the first to land on Maui in 1789 and while sailing around from the lush Hana side was greeted by hundreds of canoes at Kaupo. The canoes that came alongside his two ships were loaded with trade goods of hogs, banana, taro root and water for trading with the French frigate. This led Captain La Perouse to consider that they were not the first Europeans to encounter the Hawaiians. In fact, the map used by Captain Cook some 10 years earlier to explore the South Pacific were of Spanish origin. It is possible the Spanish had landed in Hawaii many times and kept it secret from marauding pirates. The Kaupo Ranch Adventure Tour has over 8,000 acres of riding terrain where riders drive down to the cliffs above the ocean and then shoot up 2,000 feet into the mountains. The views and landscape are unmatched. As well, there is wildlife everywhere on this tour. From ranch animals including cattle and horses to wild herds of deer and goats. Departure times from Kaupo is 10am or 1pm. 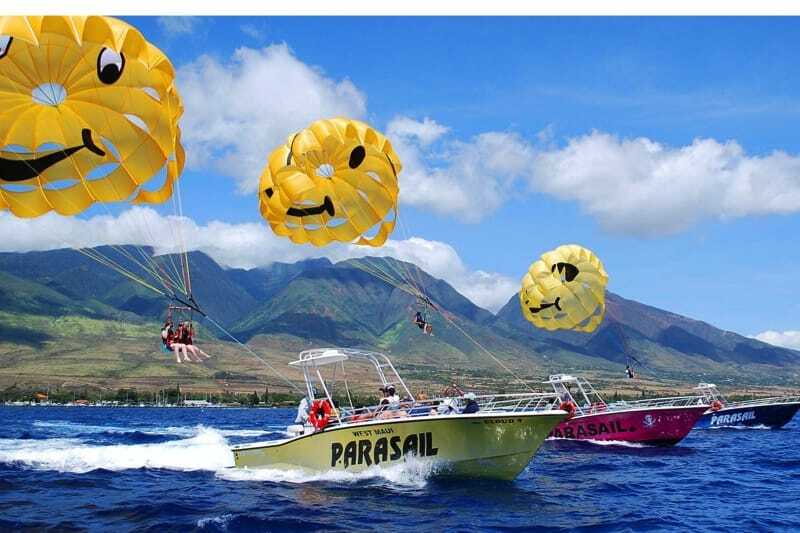 Lahaina Adventure – West Maui Mountainside Located right above the Kapalua Airport and just minutes from Kanapali beach and Lahaina is our Westside location. This location consists of over 1,400 acres of riding terrain with the most breathtaking views of the ocean. Maui Off Road Adventures has partnered with the Pu’u Kukui Watershed Preserve to not only offer one of the most amazing riding experiences ever but also to educate our guests on the beauty and importance of this beautiful preserve. Pu’u kukui means “hill of enlightenment”. It is the summit of Mauna Kahalawai, the West Maui mountainside that forms a backdrop of Kapalua Resort. It is the home to plant and animal species that exist nowhere else in Hawaii, let alone the rest of the world. It’s also one of the wettest spots on earth: Pu’u Kukui is a natural watershed on which Kapalua Resort and most of the West Maui community rely on for water. As part of an ongoing rehabilitation project to restore this beautiful mountainside to its indigenous landscape, Maui Off Road Adventures and it’s guests will plant Koa trees on each and every tour. The word “Koa” means “warrior” in Hawaiian. The Koa wood has long been used to build canoes and other important goods for the Hawaiian people and is a huge part of their culture. Koa is a treasured and valuable hardwood that represents integrity, and strength, which are foundational qualities of a marriage. Maui Off Road Adventures is proud and honored to be a part of such an important restoration project and allow our guests to enjoy such a magical and beautiful area at such an intimate level. This 2 hour adventure tour combines amazing riding conditions with breathtaking scenic views of the ocean combined with total immersion into Hawaiian culture and pristine nature. Departure times from Lahaina is 9am, 12pm or 3pm. Vehicles accommodate up to 4 passengers. You will not share your RZR with strangers - your party only! Children must ride with an adult. Vehicles accommodate up to 4 passengers. You will not share your RZR with strangers - your party only! You will receive NO REFUND WITHIN 48 HOURS of a reservation. If you arrive late for your scheduled tour, we will try to accommodate you on the next tour on the same day however, we cannot guarantee availability for tours outside of your reservation time. You will be responsible to pay the difference between the tour you want to join and the tour you book if the tour you join is more expensive. We will gladly reschedule your activity reservation prior to the 48 hour cancellation period at no extra cost. If tour is cancelled due to weather, mechanical failure, unsafe conditions, or insufficient reservations, you will receive a full refund for that tour. Definitely an off-road adventure, you will get dirty and wet! You will also be jostled around, this is not a tour if you have any back or neck injuries. We also don't recommend this tour for our elderly guests. You will be required to sign a waiver before starting this tour and the tour operator reserves the right to refuse anyone from participating in this activity (with a full refund of course). Our Maui adventures wouldn't have been the same without this amazing day! Our tour guides were so friendly and fun and our family enjoyed the amazing tours through the hills of Maui. We will be back again and highly recommend you visit! Kirby was a great guide through the hillsides of Maui. Be careful if you have back or neck problems because the ride can be bumpy and you get jostled around quite a bit, but my kids and I really enjoyed it start to finish. Kirby stopped along the way to show us pineapples growing in old pineapple fields, and picked fresh liliquoi from bushes for us on breaks, telling us about the history of this part of the island. I recommend this activity for anyone looking for something literally off the beaten path while on Maui. Me and my friend (both mid twenties) did the 9am tour and literally had such an amazing time!! It rained a lot the day before so we got to go through decent sized rivers and the trails were super muddy which made it 100x more fun. Some spots you have to go slightly slower but then there was also stretches where you could hammer the gas and go 40mph. Also there was a couple really pretty views and our guide Hunter was a really cool dude and super fun, he was always willing to take pictures for us. Definitely recommend this company to everybody looking to have an amazing atv experience! Drive your own ATV! This upgrade guarantees every driver will drive their own ATV.